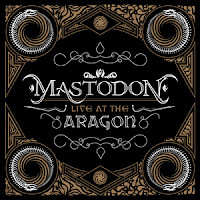 A trailer posted yesterday for Mastodon’s upcoming live release, Live at the Aragon, which includes a CD and a DVD. The performance was recorded live October 19, 2009 and it will feature a live performance of their bulletproof Crack The Skye album. Having seen them perform Crack The Skye live myself, the opportunity to hold onto something like this is worth taking. In my opinion, anyway. Live at the Aragon will be out March 16th.